This holiday lends a new meaning to the phrase 'getting away from it all'. 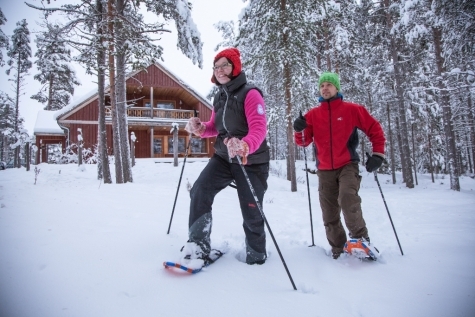 In the heart of Finnish Lapland, a region renowned for its pure air and natural light, in the midst of a white wilderness on the shores of a frozen lake, you can throw off the stresses of the 21st century and truly 'switch off'. Torassieppi provides the perfect setting for a digital detox, where you will be immersed in a selection of gentle nature-based outdoor activities. 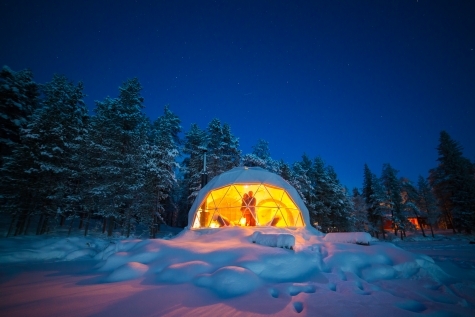 Upgrade to the Snow Hotel - Just a short walk from Torassieppi is the intimate snow igloo, which also boasts a small ice restaurant and ice bar and winter activity park. Spend a night here in your own snow room, adorned with ice art. Even though it could be -30c outside, inside the temperature remains a steady -5c and the warm reindeer skins, thick sleeping bags and hot juices ensures a comfortable and cosy stay. Privacy in the ice rooms is protected by a curtain. Shower and WC are situated in a separate block. Upgrade to an Aurora Dome - Take camping to another level with a stay in an Aurora Dome. These specially adapted domed tents are a unique offering by the Pietkainen family. Complete with a wood burning stove, rustic handcrafted furniture and clear panels that display the ever changing Arctic sky and, if the conditions are right, the northern lights – all from the comfort of the sumptuous bed. The romantic lakeside location is quite stunning and you will enjoy uninterrupted views across the frozen water. Communal showers and WC are just a short walk away. Fly to Kittila. Here you will be met by your local guide and transferred to Torassieppi Reindeer Farm, located less than an hour from the airport. 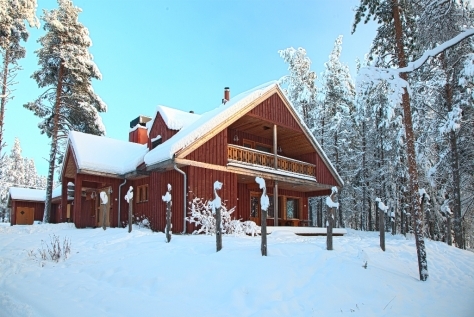 Check-in to your accommodation (all have private WC/shower and use of a sauna), then familiarise yourself with your gorgeous surroundings before an evening meal comprising of tasty, organic and traditional Finnish ingredients. It is at this point you will be handing in ALL of your mobile devices. (It is worth noting that before travelling, you’ll be given a 24/7 emergency number to give to family and loved ones, should they need to contact you). Retire for the evening, but not before checking overhead for a display of the Northern Lights, which due to the lack of light pollution will intensify the spectacle, should they show. Any noise is muffled by the deep snow that wraps itself around the resort, so you should enjoy a long a restful sleep. Enjoy breakfast before meeting your local guide, who will take you on the short walk to you the reindeer farm, the origins of which date back to 1847. 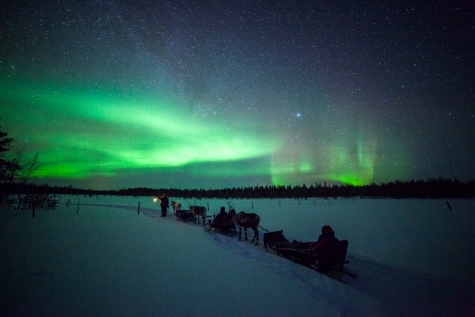 Here meet the reindeer herder,who will share his culture past and present, as well as take you on a 3km ride through the frozen forest on a traditional reindeer sled. Catch a rare glimpse of a bygone era, when you visit the original guest house and museum, stuffed with artefacts and tools that were made and used by the occupants. Lunch will be served around a roaring fire in a traditional Lappish Kota, after which you will have a cross-country skiing lesson. This mode of transport has been practiced in the region for thousands of years and is considered a national sport, as well as an excellent low impact, full body form of exercise. Together with the guide you will test your new found skills on the specially marked tracks that traverse the neighbouring National Park. You will have worked up an appetite for dinner back at Torassieppi and an evening watching the changing colours of the polar night sky, engaging with your fellow travellers or simply reading a book. By now, you will have totally relaxed into your new laid-back lifestyle and embracing the activities. After breakfast, you will be strapping on snowshoes and hiking through the winter landscape. Snowshoes were developed in order to gain access to area’s normally inaccessible by skis or snowmobile and are a very easy art to master. With a little effort, you will soon be in the heart of the forest in deep pristine white snow, accompanied only by silence, your guide and fellow detoxer’s. Return for lunch at Torassieppi and an afternoon of leisure. Do not underestimate the value of doing nothing and simply soaking up the atmosphere. The lakeside sauna is open. Alternatively, cross-country skis and snowshoes are on hand so that you can continue to improve your new found skills. After dinner, you will become acquainted with another four-legged form of transport by way of a pack of huskies, all eager for their evening run through the frozen forest. This is a magical ride at any time, and the dark night only emphasises the surreal nature of the landscape. If you happen to be accompanied by a clear polar sky, there is every chance that the Northern Lights will light the way for you. It is time to leave. We hope that you have been given the opportunity to re-examine the role that technology influences your day, at the expense of simple pleasures. Talking of which – don’t forget to collect your electricals before heading to the airport in time for your flight home. This tour is not suitable for children under the age of 12. Niina Pietkainen vowed as a child that the last thing she wanted to be was a reindeer herder, so when the Pietkainen family took over Torassieppi Reindeer Farm, she set about turning it into something more: a winter village complete with the original farmstead, lakeside cottages, restaurant and Snow Village. 8 cabins are situated alongside Lake Torasjärvi. Each has two bedrooms, living room with logwood fire, kitchen facilities and private WC/shower. Selected cabins have additional clothes drying cupboards and electric sauna. There are also 8 twin rooms spread amongst 2 cabins, each with en suite WC/ shower and private entrances. The kitchen in the on-site restaurant is proud to offer menus sourced from locally produced organic food. A new addition to Torassieppi is the Aurora Dome. Situated on the edge of the lake and facing north, they can provide a chill-free view of the spectacular Northern Lights from the comfort of your bed. These specially constructed ‘tents’ are insulated and built over a solid wooden floor. One side of the dome is transparent and has an uninterrupted view across the lake to the forests beyond. A romantic and cosy ambience is created by the wood burning stove, comfortable beds with thick duvets, chairs covered with reindeer skins and candle lit lamps. A short walk away is the shared showers, sauna and WC. This is Arctic glamping with style.